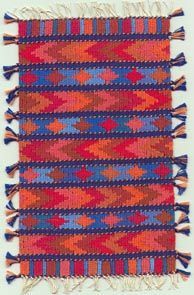 The kelims are woven with stranded cotton (floss) on a linen or cotton warp. They can be woven in any colour combinations to match or compliment your interior scheme. SIZE 6.8 x 6.8 ins (14.8 x 14.8 cms) approx. 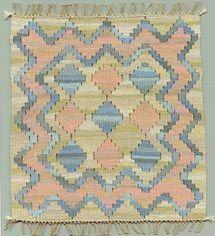 Woven in 3 main colours using numerous variations of each to achieve a faded effect. SIZE 4.4 x 8.8 ins (11.2 x 11.2 cms) approx. PRICE £10.00 per square inch.